Web of Science: What is nacreous cloud? We received a number of questions about nacreous cloud on Friday, 18 February 2005, after a fine display of this phenomenon in the eastern skies over Reykjavík in the early hours before sunrise. Nacreous cloud is a rare and extraordinarily beautiful iridescent type of cloud that forms in the stratosphere, generally at heights of between about 15 and 30 km. These clouds occur mostly at high latitudes and in the middle of winter. Their spectacular colours are seen at their best either after sunset or before sunrise, in half-light or even night-time conditions at ground level, with the sunlight illuminating them from below the horizon. The iridescence is reminiscent of the colours seen in the white layer inside certain mollusc shells (the so-called mother-of-pearl layer in oyster shells) – hence their name in various languages, 'nacre' being the technical term for mother-of-pearl. 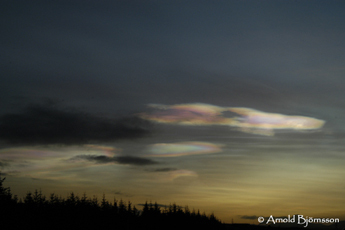 Nacreous clouds form under exceptionally cold conditions in the stratosphere (around or below -70 to -90°C) and are made up of ice-crystals, or of combinations of ice-crystals and nitric acid hydrates (for example HNO3 3H2O). In the latter case this type of cloud can lead to ozone depletion, since the surface of the ice-crystals can act as a catalyst in a chain reaction which converts chlorine in the stratosphere into harmful ozone-depleting substances such as chlorine monoxide (ClO). The crystals in the cloud diffract sunlight, but to different extents, depending on wavelength. Blue light, for instance, diffracts more than red. The red light thus reaches us at a different angle from the blue, making it appear to come from a different part of the cloud. Moving from the edge of the cloud towards the centre, the colours often come in the order yellow, red, green and blue, though in many cases the centre of the cloud can also appear white. The colours also depend on the distribution of different-sized particles within the cloud, so that one can often get mixed patches or flecks of red, yellow and green. The pictures here were taken on the morning of Friday, 18 February, and are published with the kind permission of the photographers. Mannfred Lemke of the Iceland University of Education has posted on the web an interesting video clip taken the same morning. (Most Windows-based computers should be able to handle this clip). 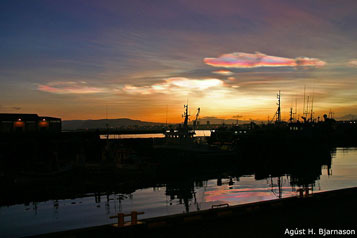 Further information and photographs of nacreous clouds can be found on various websites, for instance by clicking here. Halldór Björnsson. „What is nacreous cloud?“. The Icelandic Web of Science 5.3.2005. http://why.is/svar.php?id=4791. (Skoðað 21.4.2019).